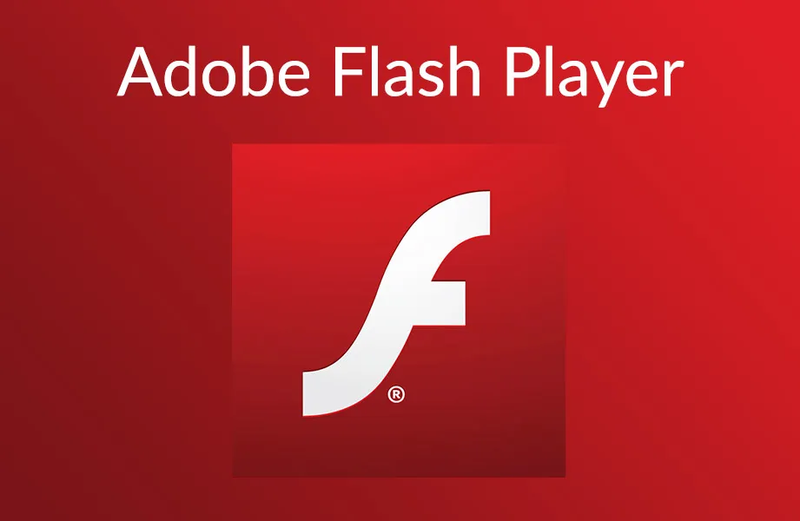 Flash technology (Adobe Flash, formerly Macromedia Flash) was developed to create interactive websites, applications and multimedia presentations. It's interesting that Apple did not implement this technology in iOS, because it considers it to be vulnerable, requiring large processor resources. Flash can be installed on macOS. The language of HTML 5 has a built-in set of functions for working with video and music and can in the future completely replace the technology of Flash. Adobe Flash technology requires increased resources when working. Because of this, the processor heats up more and the computer needs more cooling. Reduces the battery life of the laptop. Many critical vulnerabilities have been found in this technology. Updates came late and Adobe Flash was considered a non-secure application. Your IP address can be detected through this technology when using multimedia requests (playing music on web sites, watching videos). If you use anonymous VPN no logs then Flash technology can only determine the IP address of the VPN server. You can disable Adobe Flash directly in browsers or uninstall from the operating system. 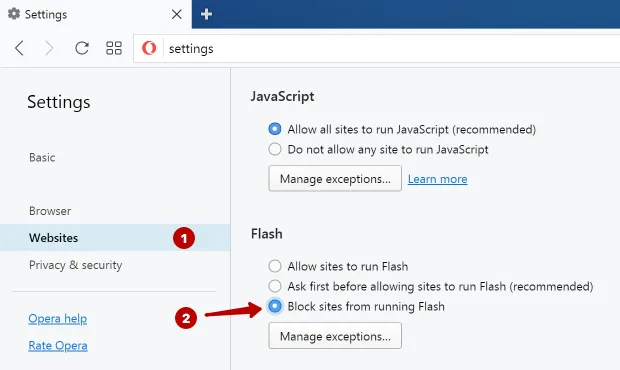 It is possible to disable Flash in the next browsers: Mozilla Firefox, Google Chrome Chrome, Opera, Safari, Yandex Browser, Microsoft Edge and Internet Explorer. 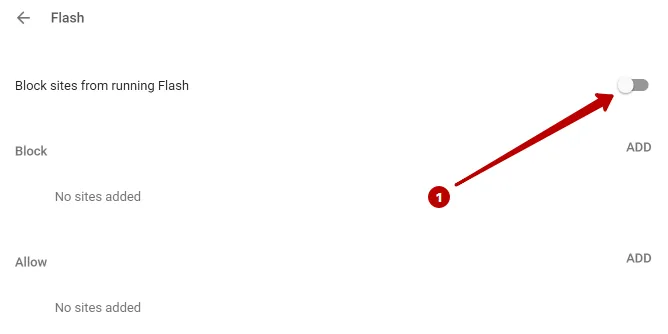 You can check if Flash is enabled in your browser on the page of Checking Flash and IP address. If you have the value Disabled, then either you have previously disabled Flash, or it is not installed in the operating system. 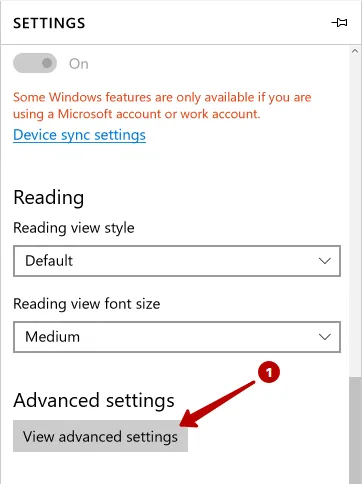 If Enabled, read on how to disable further. To disable Adobe Flash in Google Chrome, enter the following text in the address bar and press Enter. Scroll down and find Flash. Disable Adobe Flash in Google Chrome as shown in the screenshot. 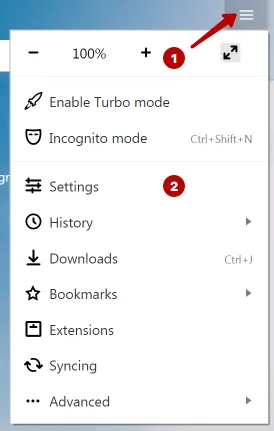 To disable Adobe Flash in Mozilla Firefox browser go to Browser settings - Add-ons. In the Plugins section, select Never Activate Shockwave Flash. If Shockwave Flash is not listed, then it is not installed. 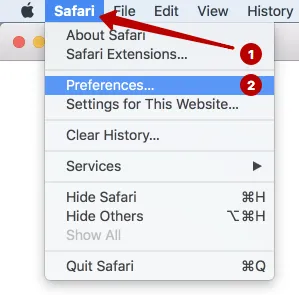 To disable Adobe Flash in Safari, go to Preferences. 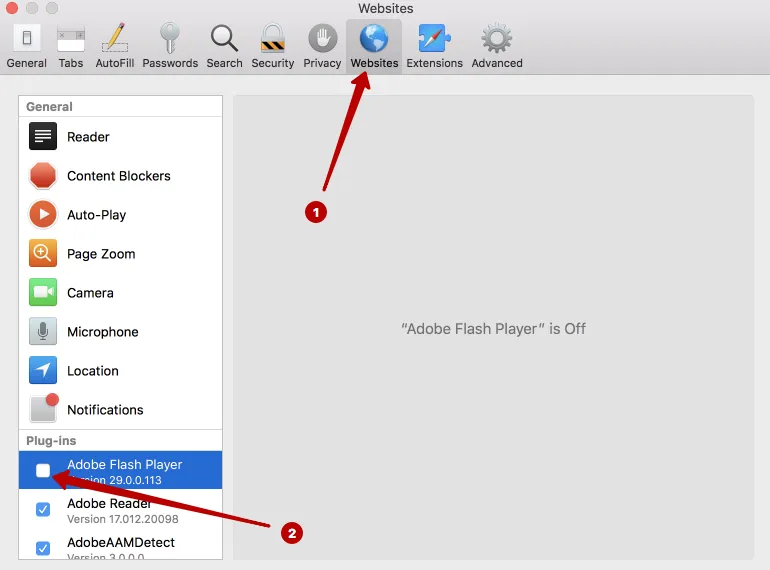 Disable Adobe Flash Player in Safari on the Websites tab. 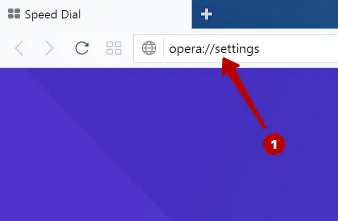 To disable Adobe Flash in the Opera browser, type the following text in the address bar and press Enter. 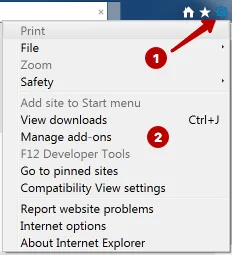 Disable Adobe Flash in Opera browser. To disable Adobe Flash in Yandex Browser go to Settings. 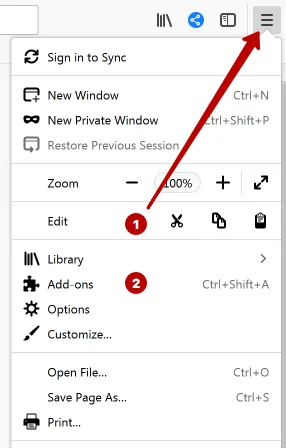 In the search field write flash and click the Content Settings button. Disable Adobe Flash in Yandex Browser. To disable Adobe Flash in Internet Explorer, go to the Manage add-ons section. 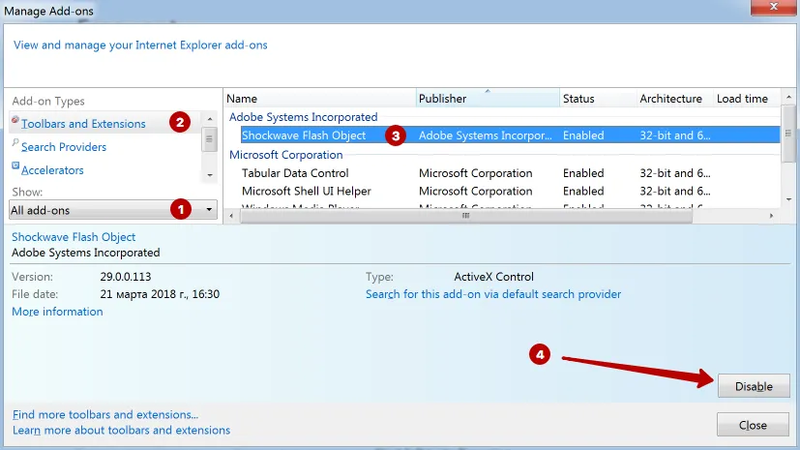 Select All Add-ons and disable Shockwave Flash Object in Internet Explorer. 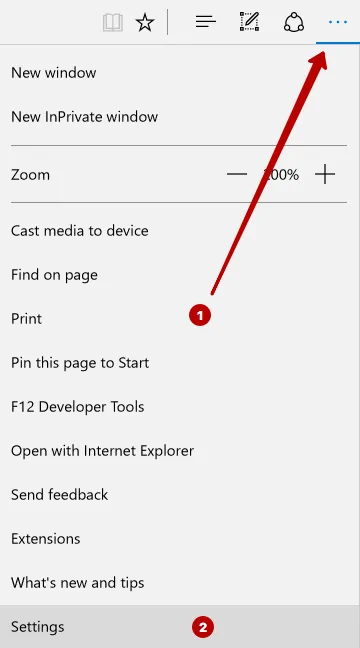 To disable Adobe Flash in the Microsoft Edge browser, go to Settings. 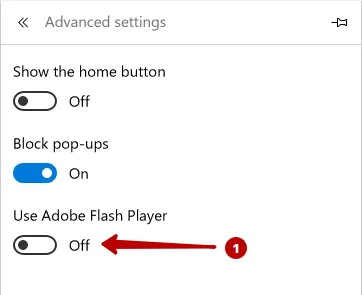 Disable Adobe Flash Player in Microsoft Edge browser. By default Adobe Flash is disabled in Tor Browser.